The U.S. stock indexes were down nearly -2% today. Prior to today, it appeared more likely the stock market would attempt to trend higher. The only positive about today’s price action was the volume was lighter. The S&P 500 stock index is now 2% above its October low and 5.4% above its February low. To reverse the downtrend, selling pressure must be exhausted as buying demand becomes dominant. If we don’t see selling exhausted and buying interest in the coming days, it appears we may see the October lows revisited in the large-cap stock index. It’s only 2% away. Looking at the bigger picture, a 2-year chart of the S&P 500 stock index shows its primary trend is still up with higher highs and higher lows, despite the volatile trading range in 2018. Nevertheless, the +/- 10% swings we’ve observed this year is a much higher range than we saw last year. The stock market is seasonally in its best period of the year. That is especially true for November and December. Although, that hasn’t been the case yet with the S&P 500 down over -4% so far in November. 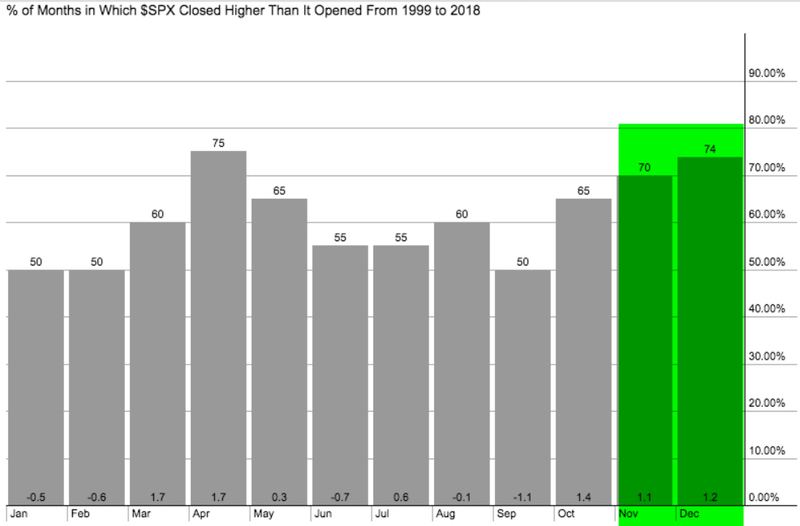 For example, the seasonality chart shows the SPX has closed higher than it opened 70% of the time in November and 74% of the time in December. We’ll see if this matches the favorable odds or if it’s one of the 30% of times it doesn’t close positive. The technology sector was the weakest today and it broke just below its October low. If its price has trended down low enough to attracting buying demand it could form a double bottom reversal and trend back up. If it continues to trend down enough, it could change its primary trend from up to down. Up until now, the tech sector has been the momentum leader. Technology is also the largest weight in the S&P 500 at 20%. It could turn out to be positive that the former leading tech sector has lead the downtrend. Reversing leadership doesn’t normally sound like a good thing, except it is one of the main sectors weighing down the overall stock market the past week. Since it’s reached its October low already, we’ll see in the days and weeks ahead if it’s reached a low enough point to attract enough buying to overwhelm the selling. In fact, momentum stocks have become the laggards recently. The S&P 500® Momentum Index is designed to measure the performance of securities in the S&P 500 universe that exhibit persistence in their relative performance. The momentum index is an index of stocks whose price trend momentum has outperformed other stocks. Indexes can’t be invested in directly, but we can use them to observe their trends. 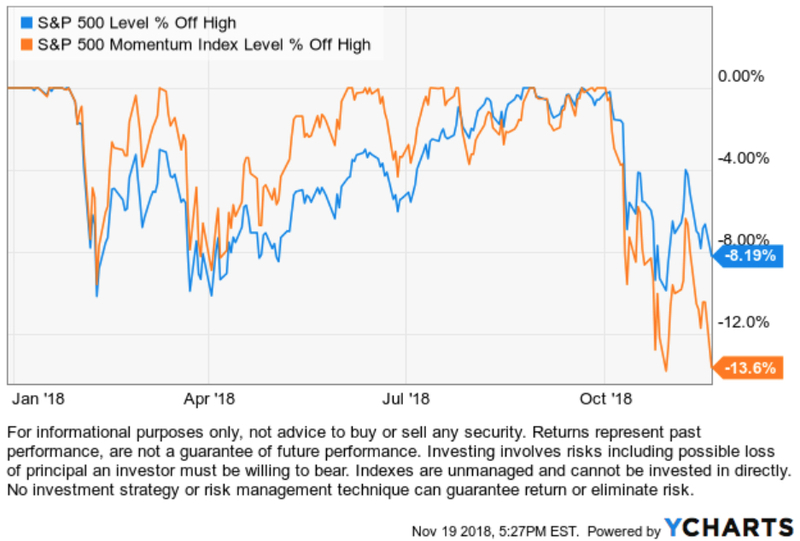 Here we see an index of stocks that were considered the leading momentum stocks have declined nearly -14% off its high, even more than the S&P 500 large-cap stock index. The technology sector overwhelms this momentum index with a 35.4% weighting. Tech had been so strong its weight is more than double the second largest weighted sector (Consumer Discretionary 15.4%). 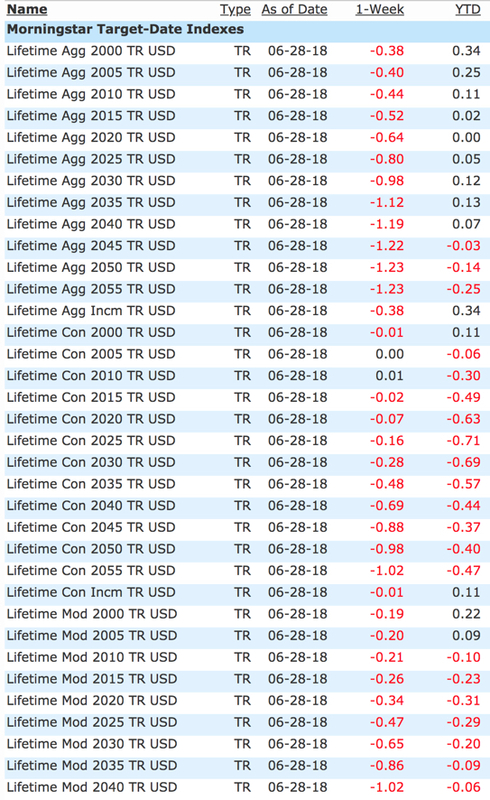 You can probably see why I prefer to increase and decrease my exposure to the possibility of loss rather than just buying and holding an allocation with no predetermined exit. Because we know there is a point we’ll exit losers rather than let the losses become larger, we won’t wait for losses to get too large and become the panic sellers. 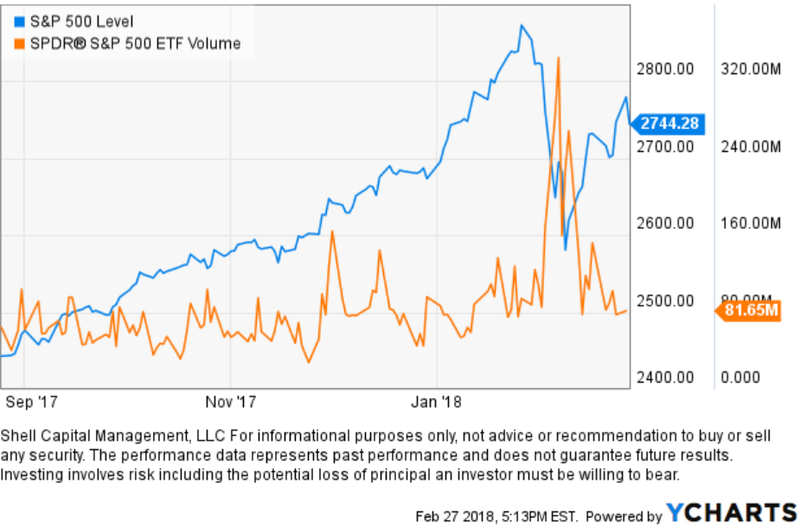 We observe many investors believe in buy and hold and passive asset allocation until they realize their losses get much larger than they expected and they respond more emotionally than they thought they would. I call it panic selling when they tap out because of fear rather than a predetermined exit point based on drawdown control. 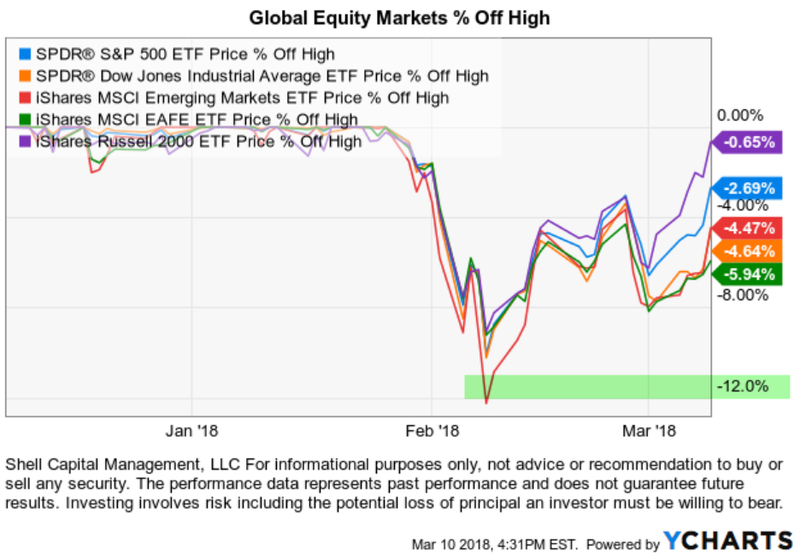 The U.S. stock market remains in the range of an inflection point and we’ll soon see if it’s going to turn down into more of a downtrend or reverse back up. We’ll see how it all unfolds from here. 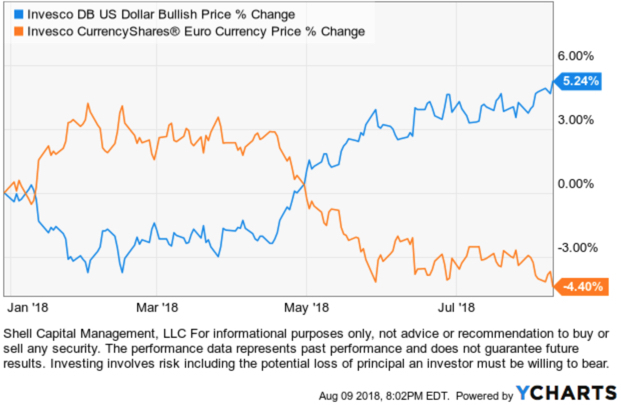 One of the more interesting global macro market trends right now is the direction of the U.S. Dollar and its impact on other markets. The chart below is the U.S. Dollar trend year-to-date vs. the Emerging Market Index ETF. Emerging Markets are newly industrialized countries whose economies have not yet reached developed status. 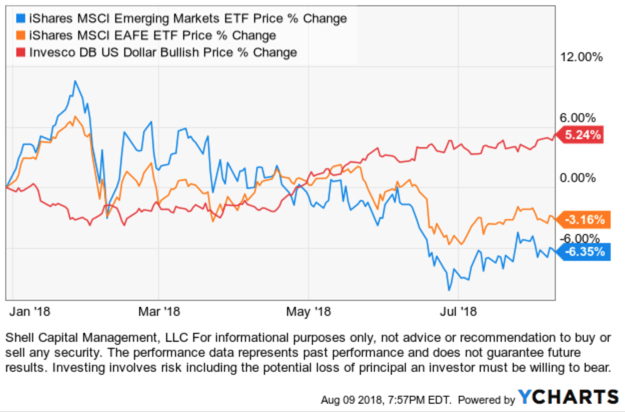 As the U.S. Dollar index has gained around 5% in 2018, Emerging Markets have trended down over -7%. At the bottom of the chart, I included the correlation coefficient of the trends between the U.S. Dollar and Emerging Markets. A high correlation value is +1, non-correlated is 0, and a completely negative correlation is -1. The value of -0.90 is a negative correlation relationship between them. As the Dollar is trending up, Emerging Markets is trending down. We don’t need a correlation coefficient equation to determine that since it’s clear by looking at their price trends, the value shows just how negative the relationship has been. Since Emerging Markets are growing countries, you can probably see how changing trends in currency rates can have an impact on them. 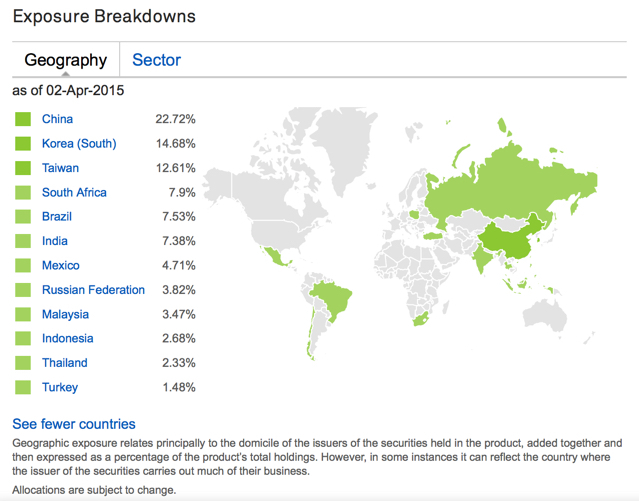 For example, countries like China, South Korea, and Thailand are Emerging Markets. If those countries are selling their products to Americans who buy them in U.S. Dollars, a rising Dollar relative to their currency makes their things more expensive for Americans. Correlation is the relationship or connection between two or more things. In investment management, we use it to measure the degree to which two or more securities move in relation to each other. Correlation is probably one of the most misused equations because professional investors seem to rely on it too much. Correlations are ever evolving – they change over time. One of the most dangerous investment management mistakes is to assume markets that are supposed to trend independently will always be negatively correlated. A grand example is the failure of diversification among markets that are supposed to trend independent to each other to provide downside risk management in a bear market. In the chart below, we show the % off high U.S. stocks, Emerging Markets, Developed Countries, and Commodities since June 1999. It shows the drawdowns of these markets from their % off price highs. The October 2007 to March 2009 “Financial Crisis” wasn’t the only time expected non-correlations failed. In the “Tech Wreck” from 2000 to 2003 we also observed international stocks, real estate, and commodities all declined together. An observation is to see something. The action or process of observing something carefully in order to gain information. What is driving the Dollar up? Ultimately, supply and demand drives the price trend of everything. If there is enough buying enthusiasm – price goes up. If selling pressure overwhelms buying demand – prices fall. Beyond this simple economic principle, I believe we have certain key drivers of global market returns. It’s things like the direction of interest rates and inflation. For example, with the Fed raising our interest rates in America, our Dollars have a higher yield for foreign investors. If foreign investors were only earning .50% on their Dollars a year ago and now it’s 1.5%, that may motivate them to buy more Dollars. Because supply and demand ultimately drives the price trend, I focus on the direction and change of direction of price trends themselves. Correlations are only a secondary observation for me. In fact, though the year-to-date correlation between Emerging Markets and the Dollar is negative, I show below these correlations do indeed change over time. However, though it’s oscillating in degree, we observe there is generally a negative correlation between the Dollar and Emerging Markets – it stays below .50. 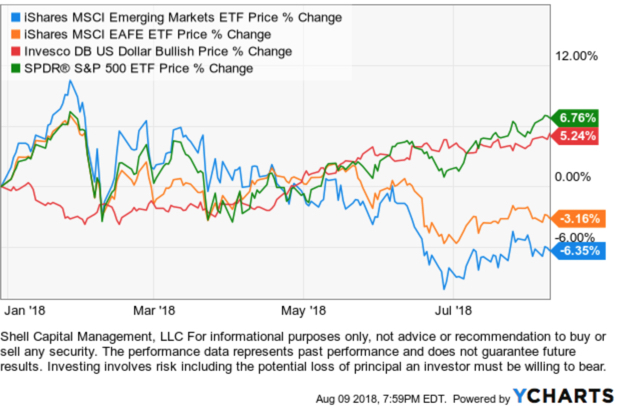 Below we see that an index ETF of Developed Countries like Japan, the United Kingdom, France, and Germany are also demonstrating a negative correlation with the Dollar, but not as much as Emerging Markets. 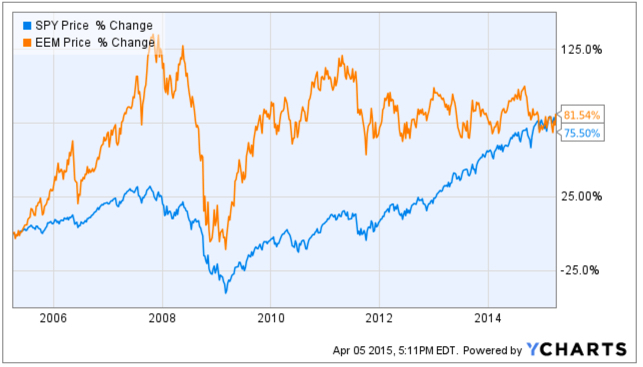 The iShares MSCI EAFE ETF (EFA) is down about -3% year-to-date with a correlation of -63. 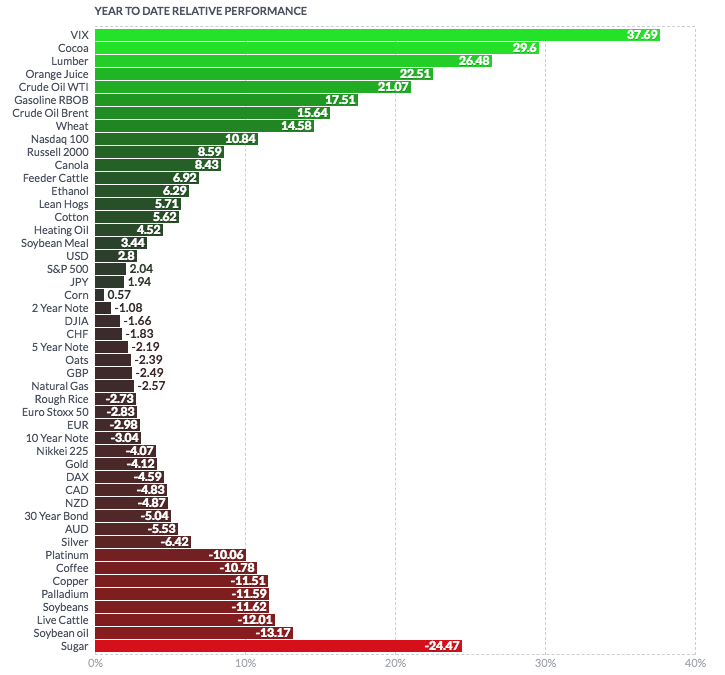 Another asset class that typically shows a negative trend vs. the Dollar is commodities. 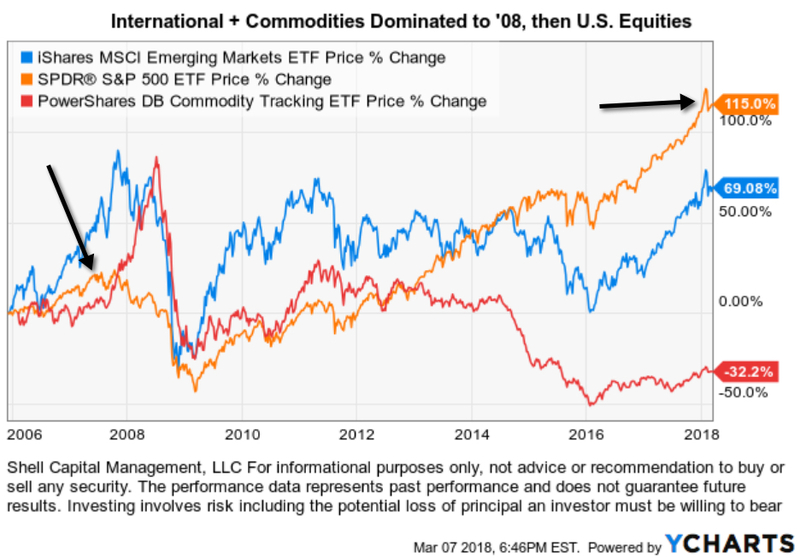 The commodities index correlation was negative up until May and has since become more connected. Just like price trends, correlations change and evolve over time. 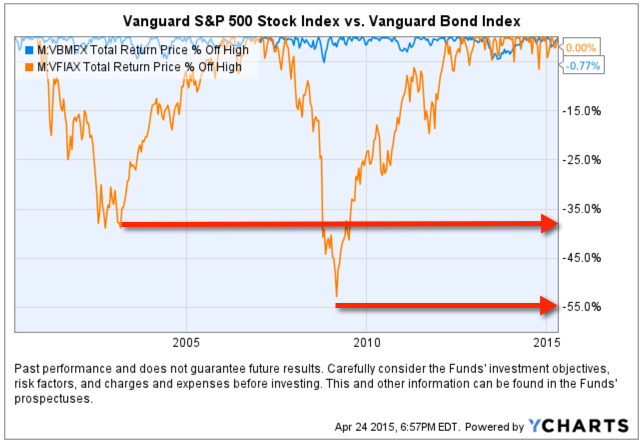 Investors shouldn’t expect them to remain intact when they historically show us they don’t. It’s interesting to observe how markets interact with each other, but their relationships change because there are different return drivers impacting them. This is why I don’t constrain myself to beliefs that require fixed causations or correlations. I prefer to be more flexible and unconstrained so I can adapt to changing conditions. Everything is impermanent – nothing lasts forever. 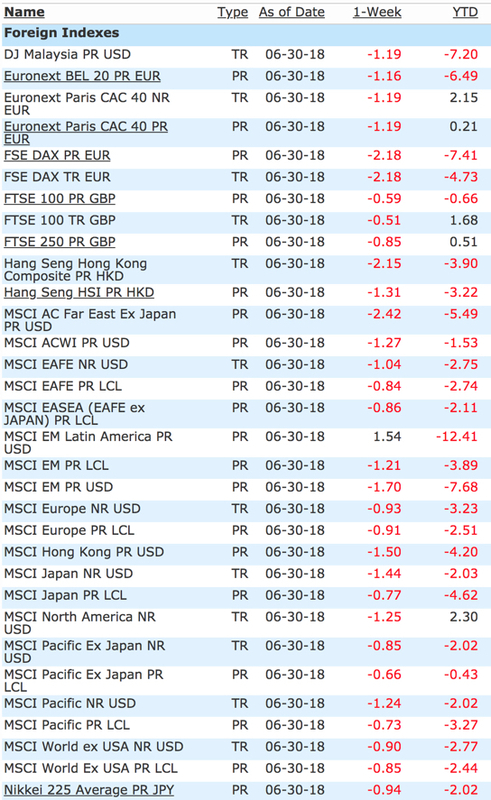 Is this correction and volatility normal? With perfect hindsight, we now all know that January 26th was the recent price peak in the U.S. stock market. 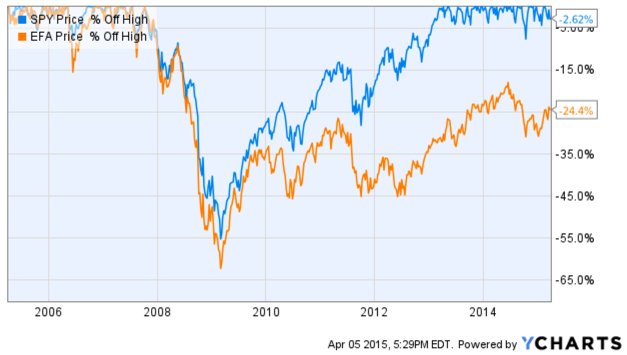 Since then, the S&P 500 has declined about -10% and the Dow Jones Industrial Average about -12%. For simplicity, I’m going to focus on U.S. stock market here. But I see recent price action has sure gotten the attention of many on social media. Some even seem dazed and confused. I’m not surprised about that, either. At this point, this is a normal and expected “correction” of what was an upside overreaction in the prior months. 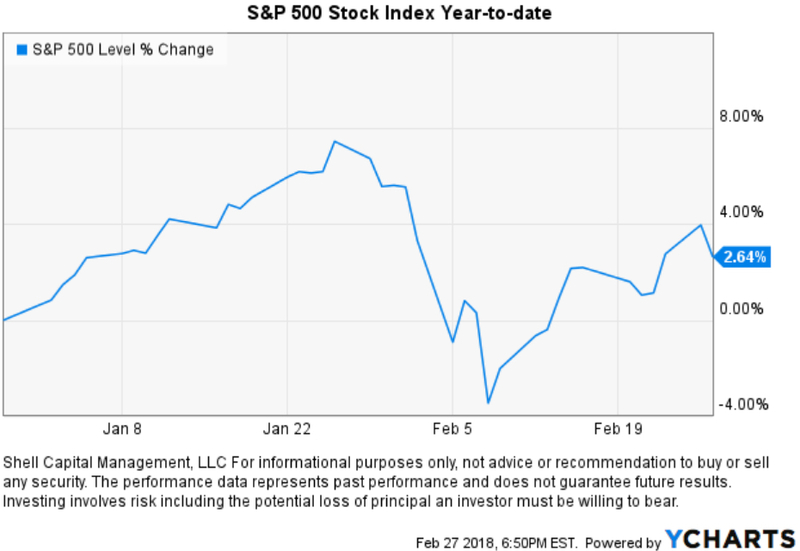 The stock index has declined about -10%, regained some of the loss in March and more recently retested the February 8th low. As long as the lows hold, I consider this a normal correction. Sure, the decline was sharp and fast, but that’s no surprise for me after such an upside move. I said it was “expected” because, as I pointed out above, 2017 was very abnormal because it lacked the typical -5% to -10% declines we normally see over most 12 month periods in the stock indexes. Another way I define a “normal correction” is a simple trend line drawn under the price over the past 12 months. Without adding a lot of complicated looking indicators to express it, below we see the stock index has just “reverted to its trend.” The peak in December and January was an abnormal overreaction on the upside, which I pointed out as it was happening. The recent -10% decline has simply put the trend back in a more normal range. What is normal, typical, or expected? I’m observing a lot of commentaries as if this correction and volatility isn’t normal. The fact is, many people often include their emotions and feelings along with price action. Investors perceive what they believe is driving a price trend and what they believe is always true for them. The February decline was commonly blamed on “the machines,” which got a little silly. I believe it’s just the market, doing what it does, and there are so many drivers at the same time I don’t bother to attempt such a narrative. My narrative is simple; the force of sellers took control and outweighed the enthusiasm of buyers. It is just the market, doing what it does. I’ve been seeing and experiencing these trends so closely for so long and I remember the regime shifts. I want to share with you my observations of what have been “normal” corrections in terms of drawdowns. A drawdown is the % decline from a prior price high to its low. I show only the period of the past 9 years, which is one of the longest bull markets in history (without a -20% decline). As you can see, since April 2009, we’ve seen four declines of -15% or more and it took them several months to recover. These declines of -15% or more are why many people have been unable to hold on to the stock market since the March 2009 low with any meaningful allocation to stocks. 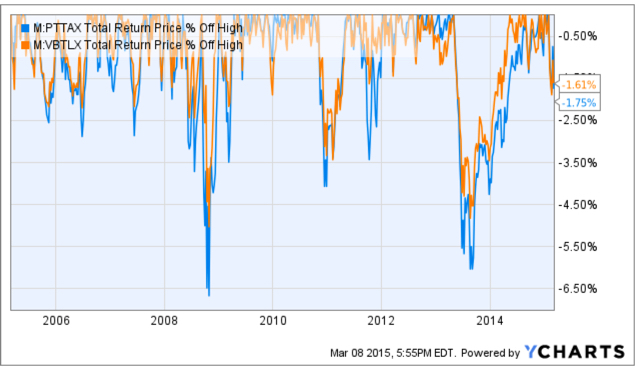 When prices fall -10%, investor sentiment shifts from greed to extreme fear. Some of them may even begin to tap out by selling their stock holdings for fear of more losses. To be sure, here is an investor sentiment indicator at the February 8, 2018 low. In fact, investment managers like me who have dynamic risk management systems may even sell to reduce exposure to loss as an intentional drawdown control. But this time, as I pointed out, the stock market was already at risk of a reversal before this decline. So, a robust risk management system may have reduced exposure before the decline, not after. We find that declines over -10% get more attention, especially when they get down to -15%. Those can also be more hostile conditions for trend systems, too, as risk management systems cause us to exit and later re-enter. The point is, over the past 9 years a -15% decline has been a “normal” occurrence and there are many -5% (or more) declines too. It is only at a -10%, so far, and that’s not unusual. I intentionally used the last 9 years. Not to show an arbitrary 9 year period, but instead to intentionally leave off March 2009. 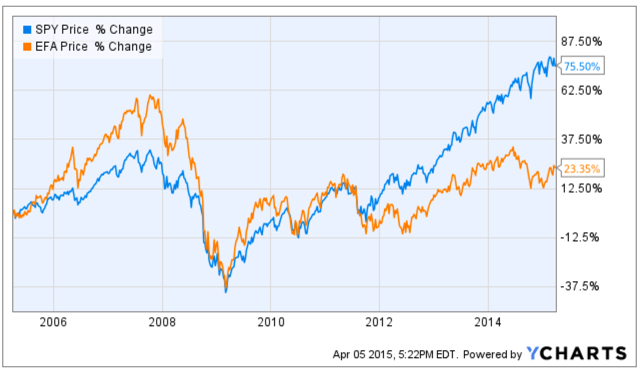 I did that because the first three months of 2009 was a -24% decline, a continuation of the 2008 waterfall decline. The stock market was still in the bear market that began October 2007. So, this wouldn’t be complete without a reminder of what that period looked like before I go on to show the pre-2008 period. All bear markets do necessarily begin with declines of -10%, -15%, -20% . They are actually made of many swings up and down along the way. We often hear people speak of the last bear market as “2008” as though the only loss was the -37% decline in the S&P 500 in 2008. That is far from reality. The drawdowns we’ve seen since 2008 are more than twice what we saw in the bull market from 2003 to 2008 after the “tech wreck.” Below we see the typical decline then was closer to -5% with only a few getting into the -7% or more range. Clearly, it was a lot easier to hold a larger allocation of stocks, then. What is normal and what has changed? The last 9 years has been more hostile for passive asset allocation investors to hold on to their stock positions because the declines were -15% or so and take months to recover. 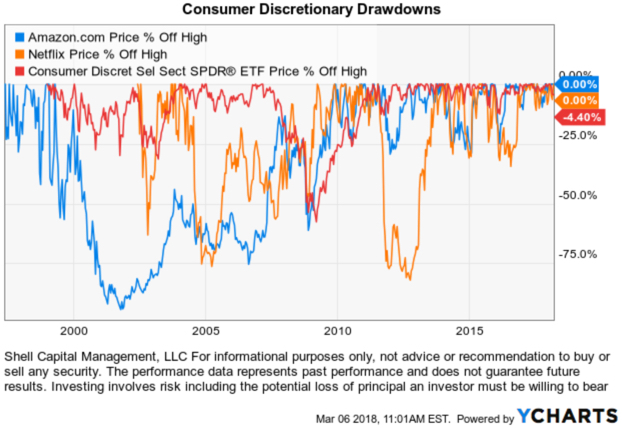 It’s also been more challenging for active risk managers since a drawdown control system necessarily reduces exposure as prices fall with the intent to control drawdown. But, to define what is normal today, a -10% to -15% decline is within a normal corrective drawdown. The recent past matters simply because that’s what investors and traders anchor to. Most people put more emphasis on the recent past. Our experience and how much we’ve studied and observed the trends determine how much we can recall easily. 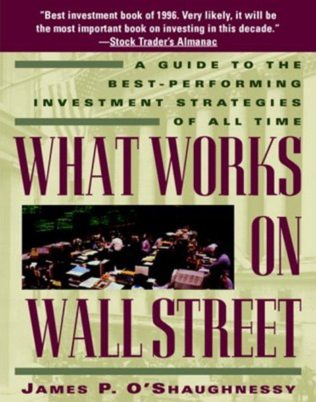 I’ve been an investment manager most of my life, over two decades now. For me, it hasn’t been a hobby or part-time venture, it’s what I do and who I am. So, my memory of these trends and intuitions about what is normal, or not, is what it is. If you are wondering, here are the drawdowns for the S&P 500 going back about 70 years. I highlighted the -15% declines or more, which obviously gets investors attention. Clearly, there are a lot of -15% or greater declines. In fact, there are several -30% and three in the -45% or larger drawdowns. 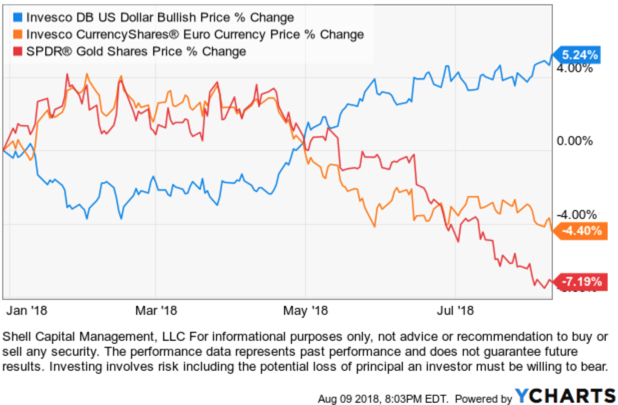 We believe world markets require active risk management to avoid large losses and directional trend systems to position capital in profitable price trends. It doesn’t matter how much the return is if the downside risk is so high you tap out before it’s achieved. Though, as I shared in The enthusiasm to sell overwhelmed the desire to buy March 19, 2018, I expect to see more swings (volatility) than last year, and that would be “normal” too. I define this as a non-trending market. When I factor in how the range of price movement has spread out more than double what it was, I call it a non-trending volatile condition. Markets decline to a low enough point to attract buying demand. Only time will tell how it all plays out from here. 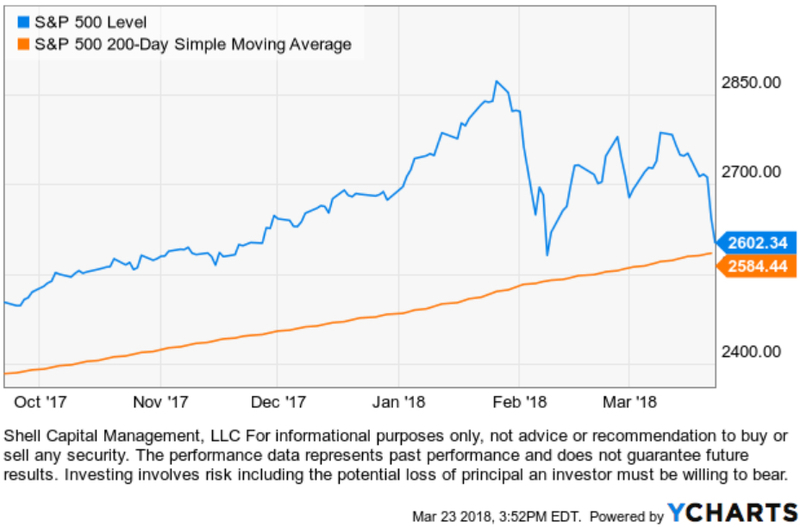 S&P 500 has declined to the 200-day moving average. I don’t trade the moving average, but include it as a reference for the chart. More importantly, the stock index is also near its low in February. By my measures, it’s also reached the point of short-term oversold and at the lower price range that I consider is within a “normal” correction. I know many traders and investors were expecting to see a retest of that low and now they have it. So, I expect to see buying interest next week. If not, look out below… who knows how low it will need to go to attract buying demand. You can follow ASYMMETRY® Observations by click on on “Get Updates by Email” on the top right. After yesterdays 1.1% gain for the S&P 500, it is back in positive territory for the year. It’s been a very volatile start for 2018 with an abnormally strong trend in U.S. stocks late 2017 continued in January only to be wiped out in February. Below is a visual representation, showing the period November 2017 to the low last month. I point that out to show how quickly a trend can change and prior gains of 12% in just a three-month time frame and be erased in a -10% decline over 9 days. Most of the decline was in two days over that period. With that said, as the broad stock market is lagging in its third month of the year so far, two sectors are leading. 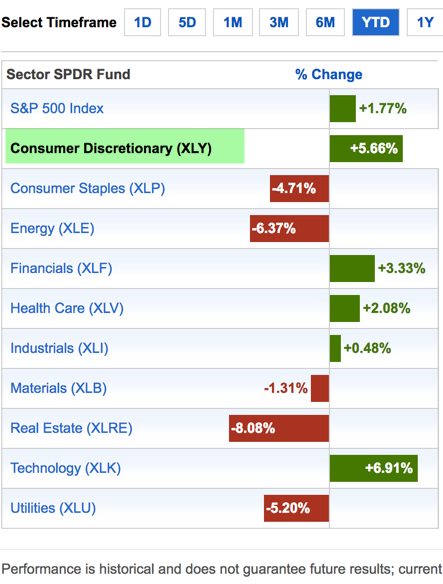 Consumer Discretionary (XLY) and Technology (XLK). At Shell Capital, we monitor global market trends at the broad market level like the S&P 500 which is diversified across 500 stocks that are a part of 10 sectors. These sectors are tradable via ETFs. We can quickly get broad exposure to the overall stock market, or we can get more granular and get exposure to a sector in a low-cost structure with Sector ETFs. I also monitor the individual stocks inside the sector ETF. When the overall market is in a positive trend, most of the stocks in a sector should be trending up. But, when the overall market has struggled to trend up, like this year-to-date, fewer stocks are trending up inside a sector. I don’t say that myself, I just observe when it is “a stock pickers market” naturally through my daily quantitative research. Here are some examples of my observation. I pointed out yesterday in Buying demand dominated selling pressure in the stock market that only 32% of the 500 stocks in the S&P 500 are above their 50-day moving average. After yesterdays stock market gain, the participation increased to 40%. The 50-day moving average is a short-term trend indicator, so if 60% of the stocks are below that trend line, we can infer “most stocks are in short-term downtrends.” As of yesterdays close, only 203 (40%) of the S&P 500 are above their 50-day moving average, which means 297 are below it. You can probably see if the price trend continues up, we should see more and more stocks participate in the trend. In fact, if we don’t see more stocks participate, it necessarily means only a few stocks are driving the broad index trend up. 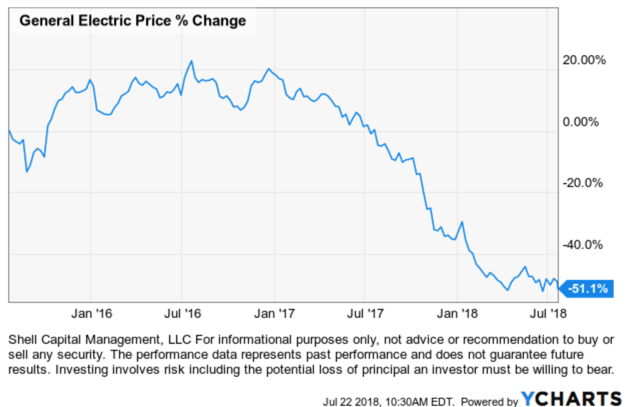 I would consider that “a stock pickers market.” Of course, the trick is to see this in advance, or early enough in the stage to capitalize on it. We don’t have to know in advance what’s going to happen next, and we don’t, we just need to observe it soon enough to capture some positive asymmetry (P>L). 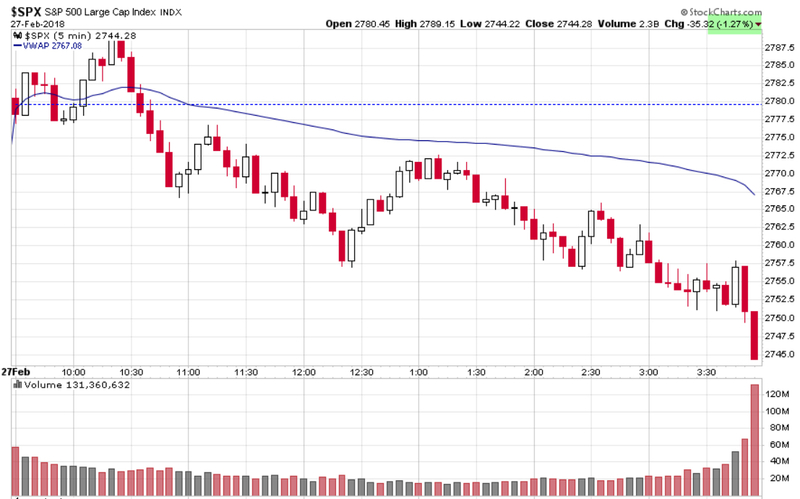 I like a visual representation, so here is the chart of the S&P 500 Percent of Stocks Above 50 Day Moving Average. I colored the top part of the chart red and labeled it “Higher Risk Zone” and the lower part green with the label “Lower Risk Zone”. 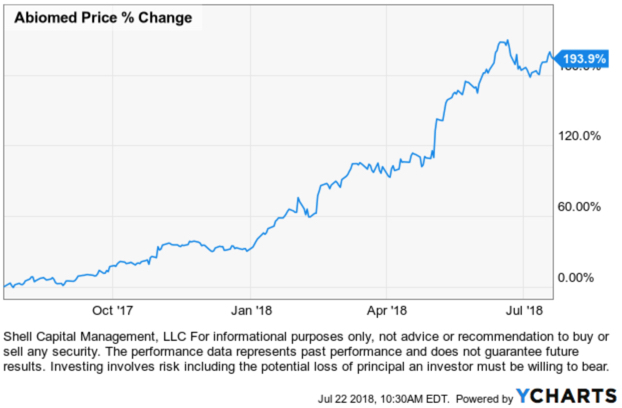 The observation is when 80% of stocks are already trending positive that momentum is a good thing, but as a skilled risk manager, I begin to prepare for change. After most stocks are already trending up, the stock market has been trending up, so a skilled risk manager prepares for a countertrend reversal that is inevitable at some point. As I shared in my observation near the low, Stock Market Analysis of the S&P 500 when nearly all the stocks were already in negative trends as a skilled risk-taker, I look for that to reverse, too. This is only a small glimpse at what I look at for illustration purposes to make the point how I can quantify a “stock pickers market.” After 83% of stocks were already in downtrends I shifted from a risk manager stance to risk-taker mode looking. That is, shifting from a reversal down in January after prices had already trended up to an extreme, to preparing for the decline to end after the stock index quickly dropped -10% and my many indicators were signaling me when and where to pay attention. I shared this to represent that I was not surprised to see certain stocks lead a trend direction when so many had shifted from positive trends to negative trends in a short-term time frame. This leads me to my main point, which is very simple. A simple way to observe a “stock pickers market” is to see that certain stocks are leading the trend. Because so may stocks were in short-term downtrends, it isn’t a surprise to see a few strong relative strength leaders inside a sector. 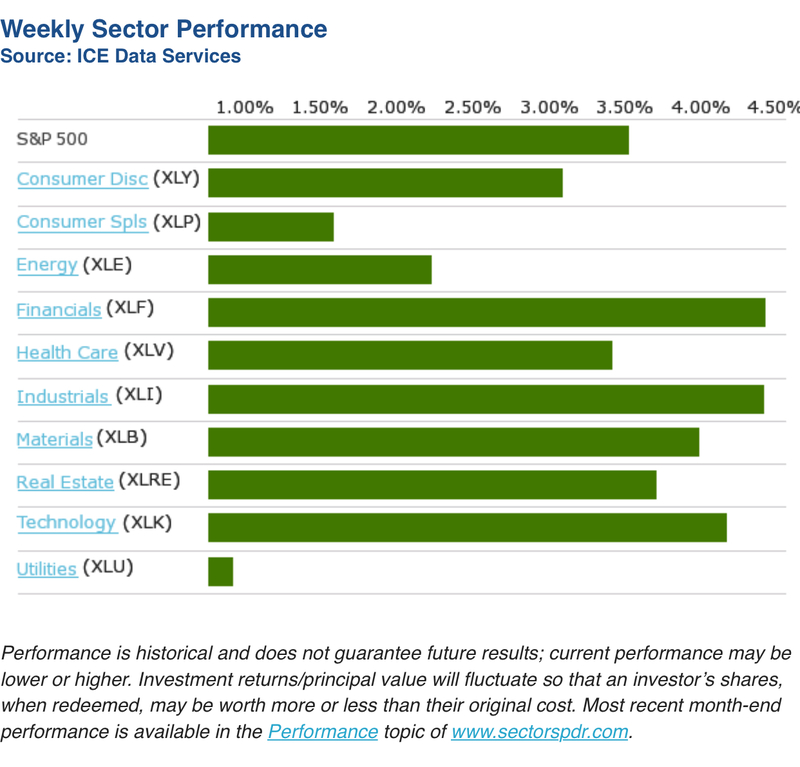 For example, in the Sector ETF performance table below, two leading sectors are Consumer Discretionary (XLY) and Technology (XLK). They are up about 6-7% as the broad stock index is up 1.77%. Let’s see what is driving their stronger relative momentum. 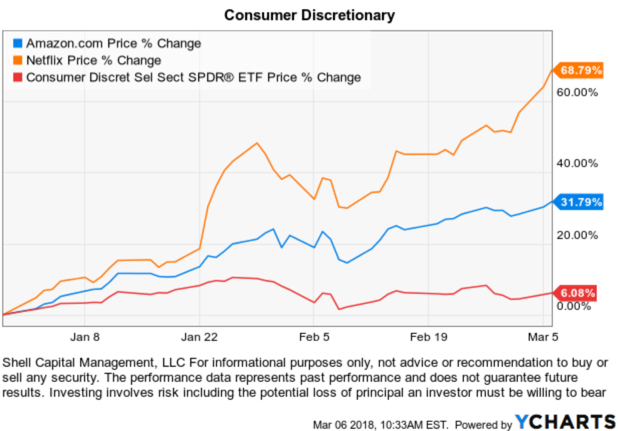 Reviewing the holdings of the Consumer Discretionary $XLY ETF, Amazon.com Inc $AMZN is 20.69% of the Consumer Discretionary Sector and has gained +30.28% for the year. A 20% weighting of a stock that has gained 30% results in a 6% contribution to the portfolio return. That is, this one large position has contributed 100% of the sectors return year-to-date. There are 84 stocks in the ETF. This doesn’t mean the other 83 stocks are flat with no price change. Instead, some of them were also positive for the year and some are negative. So far this year, they have offset each other. Some stocks in the sector have gained more than Amazon, but it makes the simple example because it’s exposure is the largest at 20%. Netflix $NFLX, for example, is the sector ETFs biggest gainer up 64%, but it’s 4.63% of the portfolio. 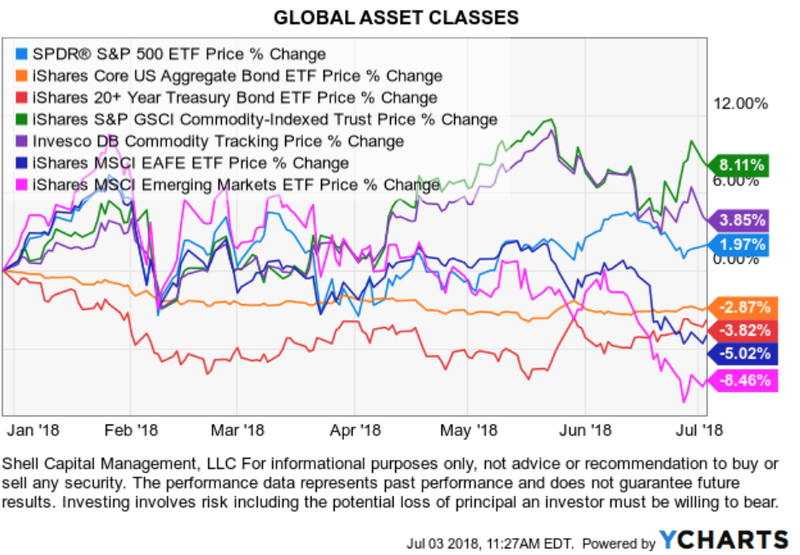 However, because it’s gain is so strong this year its contribution at the portfolio level is still significant at 3% of the 5.66% YTD gain in the sector ETF. That is an extreme example. Why is it extreme? Let’s look at price charts of the year-to-date price trend, then the drawdown, which expresses the ASYMMETRY® ratio. The ASYMMETRY® ratio is a ratio between profit and loss, upside vs. downside, or drawdown vs. total return. 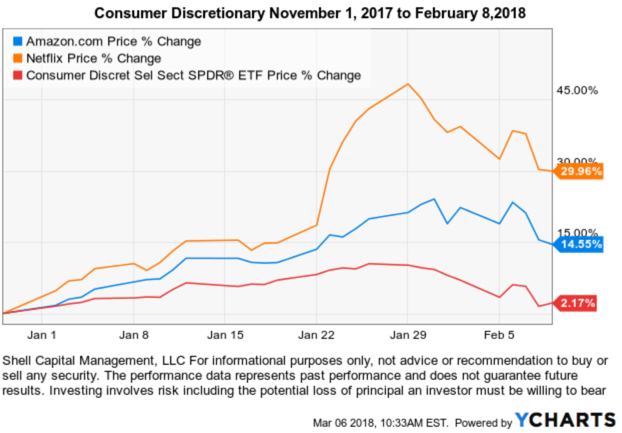 First, we observe the price trend for 2018 of the Consumer Discretionary Sector ETF $XLY, Netflix $NFLX, and Amazon $AMZN. The divergence is clear. But, you may notice they all had a drawdown a few weeks ago. All to often I see the upside presented, but not enough about the path we would have to endure to achieve it. To get a complete picture of asymmetric reward to risk, we want to see the drawdown, too, so we understand the ASYMMETRY® ratio. Those are some big impressive short-term gains in those stocks. Clearly, this past performance may not be an indication of future results. Too bad we can’t just know for sure in advance which is going to trend up with such velocity. We can’t catch every trend, but if we look in the right way we may find some. In order to take a position in them, we’d have to be willing to experience some downside risk, too. As a portfolio manager, I decide how much my risk is in my positions and at the portfolio level by predefining when I’ll exit a losing position. But, to understand how much downside is possible in stocks like this and the sector ETF, I can examine the historical drawdown. We’ve seen a drawdown in the stock market already this year. 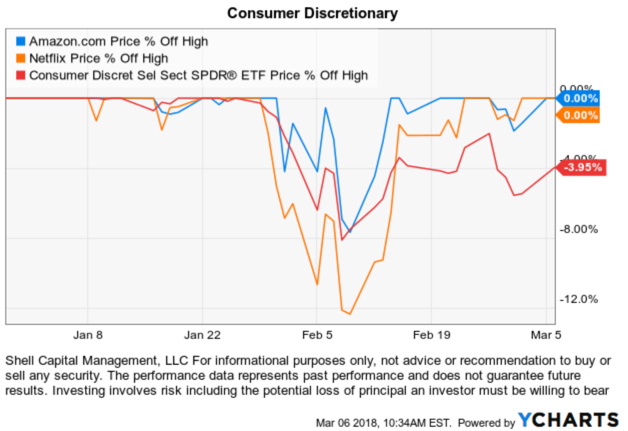 Below we see the Consumer Sector ETF drawdown was about -8% a few weeks ago. Amazon wasn’t more, even though it’s gain is much more than the sector. That’s what I’m calling positive asymmetry and good looking asymmetric reward to risk in regard to the trend dynamics. Netflix declined -13%, but its gain is much higher. This is what leading stocks are supposed to look like. They have their risk and they could decline a lot more than the market if investors lose their enthusiasm for them, but we can manage that risk with our exit and drawdown controls. I often say that it doesn’t matter how much the return is if the risk and volatility are so high you tap out before it is achieved. To better understand that, I want to show two more charts of these stocks. Below is what the YTD price change looked like at the February low. If investors watch their holdings closely and have emotional reactions, you can see how this would be viewed as “I was up 45% and now only 30%.” Many investors (and professional advisors) have difficulty holding on to strong trends when they experience every move. 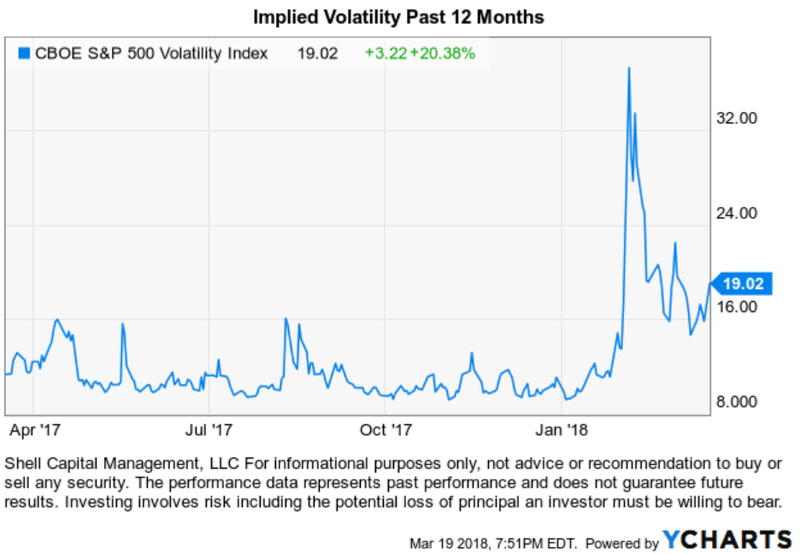 One more chart to illustrate how it doesn’t matter how much the return is if the risk and volatility are so high you tap out before it is achieved. I don’t believe we can just buy and hold and reach our objective of asymmetric reward to risk. I believe risk must be managed, directed and controlled. 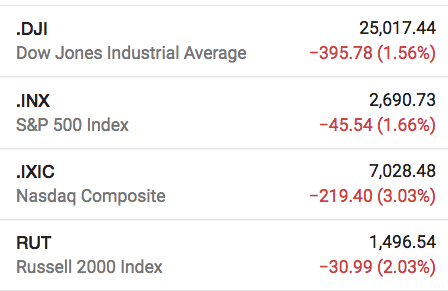 To make the point, below are the historical drawdowns that have been -60% to -90% in these three. It doesn’t matter how much the return is if the risk and volatility are so high you tap out before it is achieved! To extract positive asymmetric reward to risk, we must necessarily do something different than buy and hold. 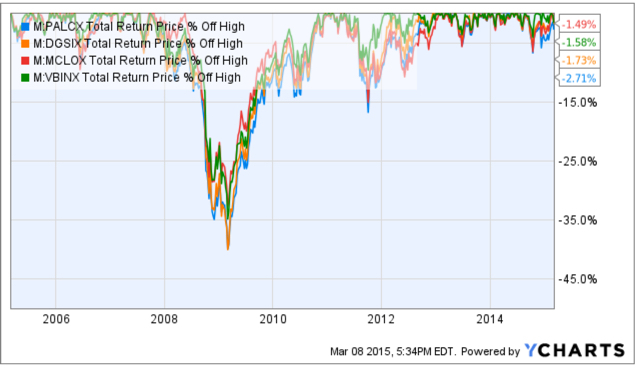 This may make you wonder: Why buy a sector ETF if you can buy the strongest stocks? The divergence isn’t normally this wide. In a trending market, more of the other stocks would normally be participating in a trend. This is why I first explained that in an upward trending market we normally see the majority of stocks eventually trending together. When that is true, the sector ETF provides good exposure and limits the selection risk of just one or two stocks. Make no mistake, individual stocks are riskier. Individual stocks are more subject to negative news like disappointing earnings reports, negative product outlook, or key executives leaving the company, etc. So, individual stocks are more volatile and subject to trend in much wider swings both up and down. But for me, I apply the same risk management systems to predefine my risk at the point of entry drawdown controls as the trend unfolds in the stock, up or down. 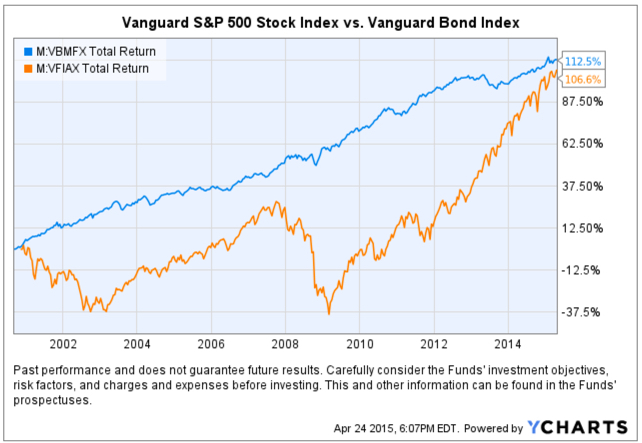 Yes, it’s been a “stock pickers market” so far and that trend may continue. It just means that fewer stocks are leading the way for now and in a healthy trend more stocks will participate if the short-term uptrend continues to make higher highs and higher lows. As a tactical portfolio manager, my focus is on what seems to offer the positive ASYMMETRY® of a positive asymmetric reward to risk. Buying enthusiasm reversed from positive to selling pressure today after the first hour. I observed notable selling volume at the close, which was the opposite of what I pointed out last Thursday.The S&P 500 Stock Index was down -1.27% for the day. 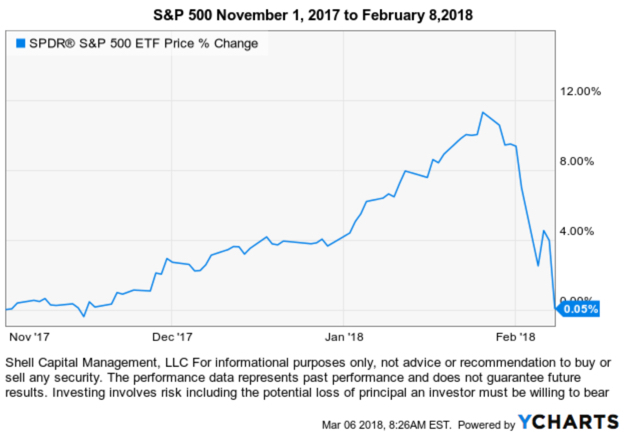 So far, the S&P 500 Stock Index has regained approximately half of its -10% loss earlier this month and is now up 2.64% for the year. Since I pointed out that the stocks inside the S&P 500 has dropped to a much lower risk zone in Stock Market Analysis of the S&P 500, the % of stocks in the index above their 50 day moving average increased from only 14% in a positive trend to 55%. Today, 18% fewer stocks are above their 50-day moving averages. None of this is yet suggesting a change of trend, but when stock popular stock indexes gain or lose more than 1% or so my plan is to update it here. We often hear that high dividend stocks are a “safe haven” in market downtrends. The theory is the yield paid from dividend stocks offset losses in their price. Another theory is that money rotates out of risky assets into those perceived to be less risky: stocks that pay high dividends tend to be older cash rich companies that pay out their cash as dividends. In theory, that sounds “safer”. I like to point out logical inconsistencies: when beliefs contradict reality. The above may be true in some cases and it sounds like a good story. In reality, everything changes. The universe is transient, in a constant state of flux. This impermanence, that things are constantly changing and evolving, is one of the few things we can be sure about. It’s a mistake to base too much of an investment strategy on something that has to continue to stay the same. It’s an edge to be adaptive in response to directional trends. 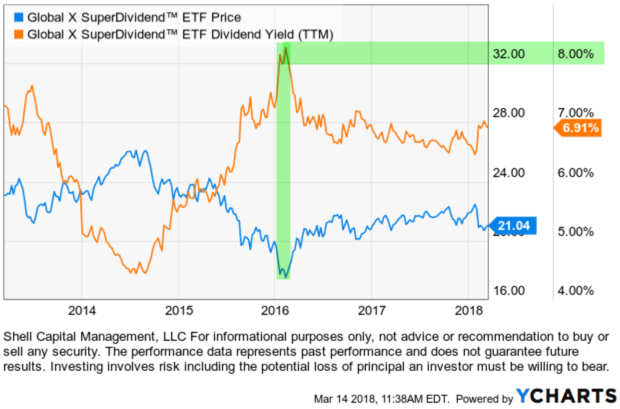 Below is the year-to-date chart iShares Select Dividend ETF that seeks to track the investment results of an index composed of relatively high dividend paying U.S. equities. 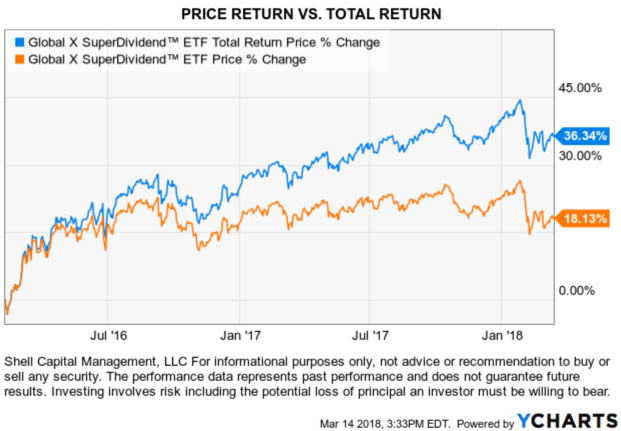 Notice that I included both the price change by itself (blue) and the total return that includes price plus dividends (orange). The “help” from the dividend over the past six months has helped a little. The price is down -3% but factoring in the dividend leaves the index down -2.33% for the year. The 0.7% is the dividend yield so far. In contrast, the Dow Jones Industrial Average is up about 1% over the same period – counting dividends. 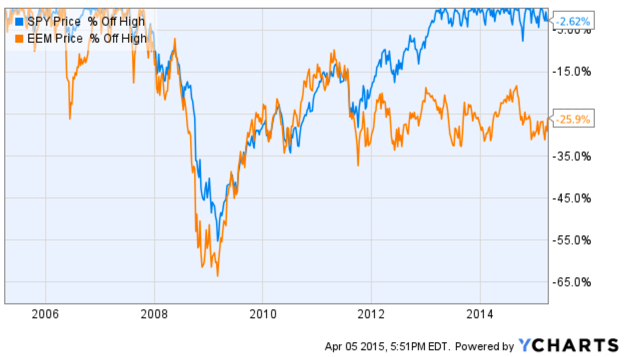 You may be wondering what is causing this divergence? 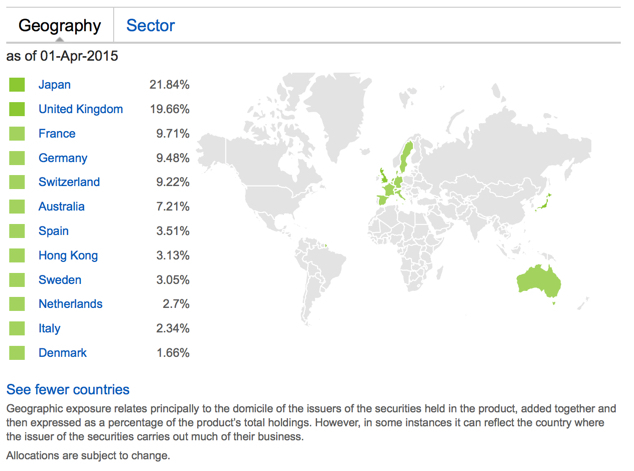 Below is the sector holdings for the iShares Select Dividend ETF. Wondering what may be driving it? For the Utility sector it’s probably interest rates. 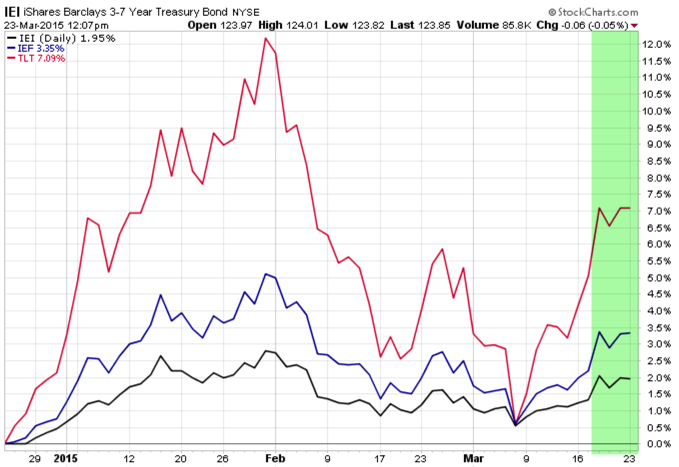 You can read about that in What You Need to Know About Long Term Bond Trends. I prefer to rotate between sectors based on their directional price trends rather than just allocate to them with false hope they may do something they may not.